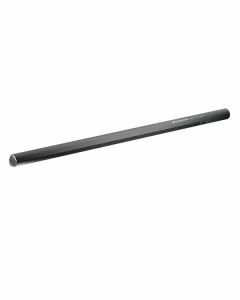 The MKH 80770 from Sennheiser is an insubstantial yet resilient long shotgun microphone that delivers transparent and natural sound. Dependable under the harshest environmental conditions, the microphone's symmetrical RF transducer design provides high sensitivity, low distortion and superb transient response. It is ideal for major broadcast and sporting events thanks to extreme directivity, reliably capturing distant sounds even under the toughest sonic and environmental conditions. The improved short interference tube returns an agreeable supercardioid/lobar pickup pattern, suppressing off-axis sound without colouration to craft exceptionally natural and detailed results. Thanks to its compact design the MKH 8070 is ideal for boom or camera mounting. The microphone ships with an analogue output module with an XLR connector, but with the appropriate accessory, the body can to interface directly into digital systems via the optional MZD 8000 digital module.